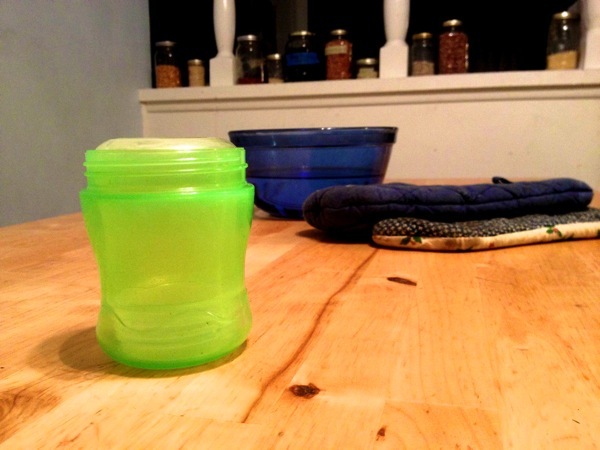 Karyn (my wife) told me that everyone at home has been trying to pull apart these two plastic baby sipping cups that have been pressed together for days (not sure for how long). The smaller cup was so far inside the larger one, that there was no edge to hold on to. This entry was posted in My Kids, science, wife and tagged fun, kids, problem-solving, science, teaching on 2013-11-20 by ezraengle. Today, while Karyn prepared for and attended her sister’s wedding shower, I hung out with all five of my kids. I dug out the baby backpack from the garage and let Gideon try it out for the first time in his life. He did fine in it. I was grateful to be able to have use of both of my hands too. Karyn had ingredients for making lunch left on the counter for me, so I prepared nachos. After lunch, I had the kids clean up the kitchen and their rooms before watching some “My Little Pony” on Netflix. 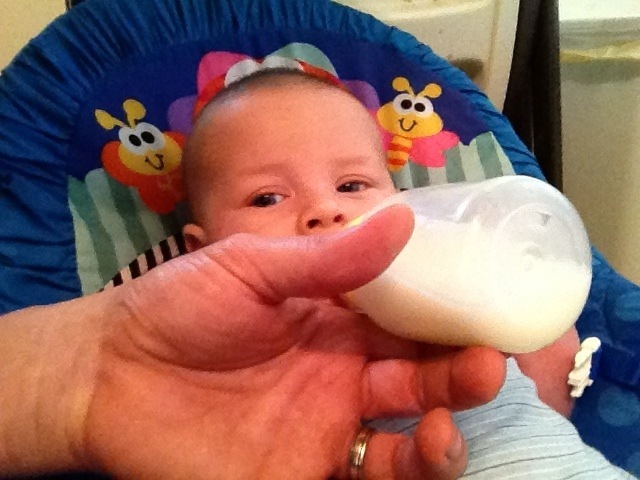 I heated up the Medela bottle of milk in the fridge and fed Gideon. Later, we all walked to the park, crossing a precarious crosswalk where local drivers do not normally observe the speed limit or notice pedestrians stepping foot into the street. This time, I asked all of my kids to raise their hands and wave at the cars coming, and it proved to be very effective. All of the cars stopped appropriately and waited for us to safely cross the street. This method sure beats my previous method of yelling and shaking my angry fist of fury as cars continue to approach us like we were a bunch of worthless grocery bags blowing in the wind. The kids all played hard at the park and chased each other around. It is good to see them doing that outside which creates so much noise that normally irritates me inside the house. I should remind myself next time I catch them running around in the house that it has been a while since we have gone on a nice walk to the park. We had to walk quickly home, because Karyn called to let me know that she had no key to get into the house, and I am pretty good about making sure all the locks are secured before leaving the house. This evening we went to visit grandma Arlene’s house, ate some sandwiches and had dessert (orange sherbet) while socializing. I don’t normally blog about a given day in my life, but a friend gave me this iPad compatible keyboard he got as a gift, and he gave it to me because he does not have an iPad. I just figured I should really test it out. Even though I would not want to carry something like this around with my iPad, I am pretty impressed with it. pretty much feels the same as my Mac’s bluetooth keyboard. Thanks for reading! 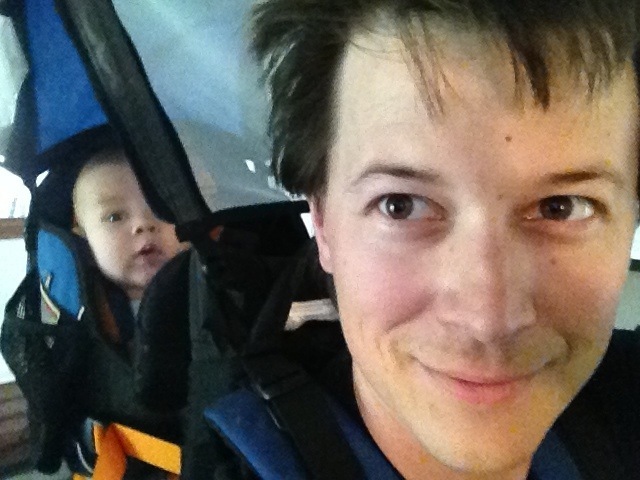 This entry was posted in child, family, My Kids and tagged kids, lunch, park, walk on 2013-04-06 by ezraengle. When I got home yesterday, upon entering my house, I was stunned to smell a strong gasoline odor. I asked Karyn what happened, and found out that she had mowed the lawn and that the mower leaks gas. Confused, I wondered why she would have the mower in the house. She was busy doing tasks walking from here to there and I prodded to figure why the smell was so strong in the house. She said that the mower is in the garage and that she just opened the door to get clothes from the dryer not long ago. I am guessing that she had gotten acclamated to the odor, because she did not seem bothered by it. I suggested that I take the kids outside for a while until the odor dissipated. She agreed, and I went through the house opening windows and doors, switching our air conditioner from recirculate to ventilate. Within a minute, the atmosphere had been refreshed. The kids were all excited to go for a walk though, so I grabbed my camera and phone and walked with the kids outside. We were going to walk just around the block, so I wanted the kids to hold each other’s hands while I led them and took a few photos. Josiah, understanding my intent, arranged Noah and Zion with himself to stand in order by height for a posed group shot in front of our van in the driveway. They walked down the sidewalk precariously strolling, Noah and Zion veering often away from the concrete into the decorative rock landscaping and stumbling, frustrating me a bit, knowing that there would be tears when they fell. I prefer to avoid the tear management problem altogether, if possible. We stopped in front of a field of foxtails, which are a novelty to Josiah, and consequently, Noah, and to a lesser extent, Zion. They plucked a few of them and before boredom was unanimous, we continued on. Next we saw a curious tree stump, with stakes holding caution/cuidado tape around the sight. I wondered what the warning was about, since I hadn’t thought of a tree stump being where a tree had been for years as something to catch a passerby by dangerous surprise. After a bit more walking we saw a hydrant. I asked Noah if he knew what it was; he didn’t know. Same question to Josiah, and he was at a loss for the name of it but wanted to assure me that it’s purpose was explainable. “that’s where the firemen put their hose onto to put water on fires” he explained. Not to bypass Zion, I asked her if she knew what it was, and she did not know. I thought the hydrant looked cool, and I always like my kids in a picture, since a still inanimate life image does not have the lasting value of any image featuring people, and my kids are great examples of people loved and almost always avialable to me. This entry was posted in My Kids and tagged family, kids, photography on 2009-04-23 by ezraengle.